Regular readers of the blog will know how much I love Twinkl. I'm always printing out resources for the children, whether it's on topics that they are studying at school or things that they've shown an interest in. With Christmas approaching, Twinkl have a huge range of Christmas themed crafts and accessories, and with children that love colouring and crafting I thought we'd use some of the printables to create our own unique Christmas decorations. Twinkl have a fantastic Mindfulness Colouring Christmas Decorations pack (Twinkl subscriber resource) which contains a lovely selection of printable Christmas decorations for children to colour, with some really pretty intricate designs that will keep them busy for ages. They are also great for adults to colour as well as they are so detailed, really lovely for the whole family to colour together. The pack contains baubles, paper chains, stars and angels. The baubles in this pack were my favourite, you can use whatever cheerful colours you like and then cut and assemble them to hang on the tree.They are a bit fiddly so it's best if an adult can put them together and it's best to use a glue stick style glue so that it sticks down instantly. We used shiny silver ribbon to make hanging loops and then glued sequins all over them for a bit of bling, I think they look fab, they would be great in a school or childcare setting where each child could make their own bauble for the tree! If you want something a bit quicker, you can also download and print a pre-coloured version of the same baubles here - Christmas Paper Baubles Decoration (Twinkl subscriber resource) - which just need to be cut out and glued together, again you could bling them up a little with sequins or stickers. Some printable baubles that are a bit easier for little ones to put together themselves are these Simple 3D Paper Christmas Baubles (free download). 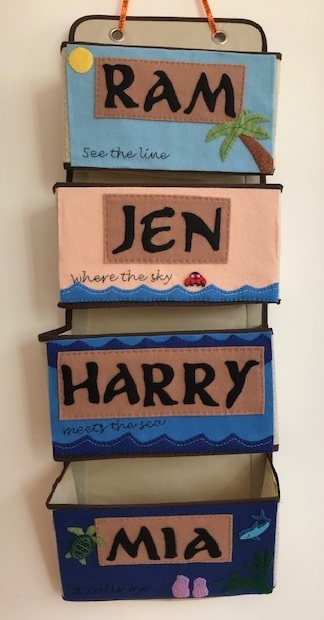 You can print either a completely blank template for children to come up with their own designs, a black and white one to colour, or a colour version that just needs to be assembled. Here are the pre-coloured ones, they are really easy to put together. Then here are some of the ones that we coloured in ourselves. We used felt pens to colour some of the baubles as well as these gorgeous Metallic Ink Gel Pens from Uniball which add a lovely shiny texture to the colouring and are great for highlighting some of the details. 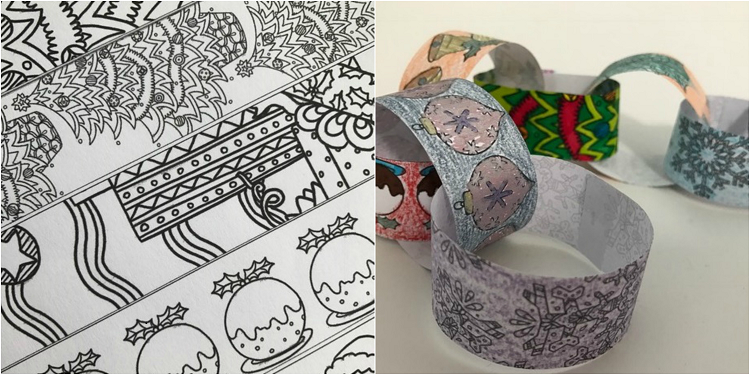 We use the metallic gel pens again for these paper chains, also printed from the Mindfulness Colouring pack above. I have very fond memories of making paper chains to hang up around the house when I was little and I love that you can involve your children to make some really unique decorations. 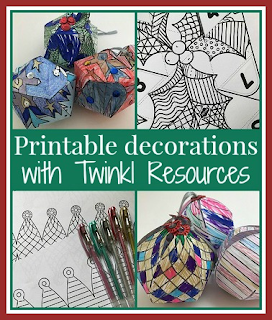 Although these decorations are mainly made using subscriber resources, Twinkl also offers a great selection of free resources which you can adapt for your Christmas crafting. For example, I printed out some of the pages from this Colour in Christmas Cards (free download) resource and cut out some of the Christmas images. The children coloured them in, then I cut them out and we stuck them to some circles of gold cardboard and added ribbon to hang from the tree. As you can see it has been a while since Mia last saw a snowman - she's coloured him blue! Twinkl have such a huge range of Christmas printables it's well worth having a browse. If you are looking for some more free resources, you might like this Cutting Skills Christmas Tree Activity (free download), which would make a lovely decoration on the wall once it's coloured in. You can also make your own Advent Calendar with this Design an Advent Calendar Activity (free download) and either draw some Christmas pictures or cut out pictures of friends and family or from festive magazines to go behind the windows. I'm a Twinkl blogger and have been given a Platinum Plus subscription. I received the gel pens to review.